It seems like more and more bloggers are getting frustrated with making mere pennies with Google AdSense every month. This is one of the concerns I addressed in my post 5 Changes That Drastically Increased My Google AdSense Revenue. I received such a strong reaction from that post that I decided it was time to write a book to dive even deeper into this issue so that bloggers could see that making money with AdSense really is possible. 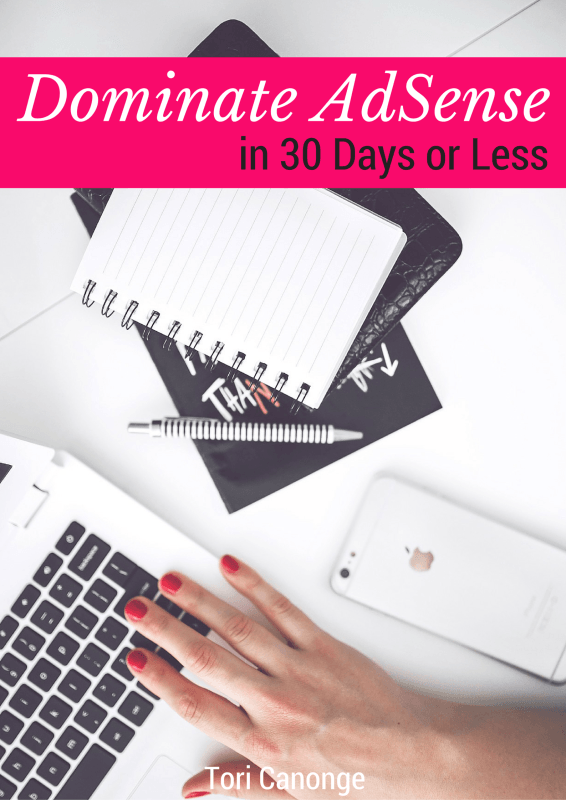 Today, I’m excited to present you with the finished product: Dominate AdSense in 30 Days or Less. This ebook is for anyone who uses Google AdSense or has considered monetizing their site with ads. As a blogger myself, I know the challenges that bloggers face and I understand how extremely frustrating it can be to figure out how to best monetize your blog. When I wrote this ebook, I had you (yes you!) in mind because I’ve been in your shoes. I know how upsetting it feels to only see a few pennies in your AdSense earnings every day. I know how it feels to wonder if you’ll ever reach the payment threshold. And I never want you to have to feel that this is how it has to be forever. Dominate AdSense in 30 Days or Less cuts through all the mess and gives you a straightforward approach to making AdSense work in your favor. As someone who learns in a variety of ways, I wanted to make sure that I included screenshots and step-by-step directions so that anyone could follow along. I created the book in PDF form so that it could be instantly delivered to you. So instead of waiting for the book to arrive on your doorstep, you’ll have instant access so you can start implementing these tips today! Besides, who wants to spend another day not making money from AdSense? I spent a lot of time trying to figure out how long this ebook should be. I had read a few AdSense books that were well over 100 pages, but I felt like so much of the material was useless. As a blogger who also works a full-time job, I know how valuable time is and I didn’t want to write a bunch of random information just so that Dominate AdSense in 30 Days or Less could be longer. After completing the ebook, I was satisfied with the 33 pages of content that I wrote. Keep in mind that these are 33 full-sized pages, meaning 8 1/2 x 11 inch paper with only 1/2 inch margins. In each section, I give you the rundown of what changes to make to increase your Google AdSense earnings. I show you where to make these changes, how often you should do them, and what stats you should be paying the most attention to. Everything that is included in this ebook I have tried myself! I have no doubt that this book will pay for itself in no time if you follow these tips and continue to write quality content (because that’s how you get traffic, right?). So what are you waiting for? Get Dominate AdSense in 30 Days or Less today and start seeing your revenue increase! P.S. If you’re interested in becoming an affiliate for this book (meaning you get a percentage of every sale you refer), let me know by emailing me at hello@chasethewritedream.com! Thank you for all the information, this helped so much! I debated purchasing it because I had already set up adsense but I was still a little confused. I’m so glad I purchased the book.